You may have seen Sara and me kibitzing in the corner of Coffee Obsession and gallivanting down 495 to procure packaging for our new venture. You may be wondering what we are up to, or maybe not. If you are at all curious, you’ll be glad to know, it’s time for the unveiling. We take our favorite recipes and tweak them by adding layers of flavors and extra naughtiness. Everyone likes mac ‘n’ cheese, so how about Sharp Cheddar Mac ‘N’ Cheese with Chorizo? Sure, cupcakes are great but have you had an Espresso Chocolate Glazed Devil’s Food Cake? 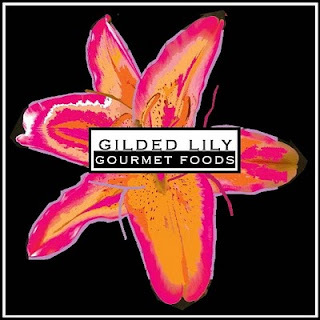 That’s what we mean by “Gilded Lily”: delicious food with a little something extra while at the same time affordable and convenient. Here’s how it works: we post a menu every week on the web, face book, email, smoke signal, however you like to receive information. Choose what you like and call or email to place your order. Ask for Sara and she will guide you through the process. Pick up days are Tuesday and Thursday (5:30pm-7:00pm) but we’re pretty flexible so let us know how we can make it work for you. There will be plenty of variety to keep you satisfied. That means you only have to order pizza or eat toast possibly 3 nights out of seven. We hope you enjoy our delicious offerings as often as possible. After all what can be better than indulging after a hard day in a warm meal lovingly prepared by someone else? No one will care if you wear your sweats and put your feet up while you savor our Slow Cooked Beef with Rosemary, Onions and Carrots served over Crispy Polenta. A “High end…Low profile” dinner is just a phone call away. What are you waiting for?